Aboriginal title was first acknowledged in the early 19th century, in decisions in which indigenous peoples were not a party. Significant aboriginal title litigation resulting in victories for indigenous peoples did not arise until recent decades. The majority of court cases have been litigated in Australia, Canada, Malaysia, New Zealand, and the United States. Aboriginal title is an important area of comparative law, with many cases being cited as persuasive authority across jurisdictions. Many commentators[who?] believe that the doctrine is applicable in all common law legal systems. In 1608, the same year in which the Doctrine of Continuity emerged, Edward Coke delivered a famous dictum in Calvin's Case (1608) that the laws of all non-Christians would be abrogated upon their conquest. Coke's view was not put into practice, but was rejected by Lord Mansfield in 1774. The two doctrines were reconciled, with the Doctrine of Continuity prevailing in nearly all situations (except, for example, public property of the predecessor state) in Oyekan v Adele (1957). Australia did not experience native title litigation until the 1970s, when Indigenous Australians (both Australian Aborigines and Torres Strait Islanders) became more politically active, after being included in the Australian citizenry as a result of the 1967 referendum. [n 2] In 1971, Blackburn J of the Supreme Court of the Northern Territory rejected the concept in Milirrpum v Nabalco Pty Ltd (the "Gove land rights case"). The Aboriginal Land Rights Commission was established in 1973 in the wake of Milirrpum. Paul Coe, in Coe v Commonwealth (1979), attempted (unsuccessfully) to bring a class action on behalf of all Aborigines claiming all of Australia. The Aboriginal Land Rights Act 1976, established a statutory procedure that returned approximately 40% of the Northern Territory to Aboriginal ownership; the Anangu Pitjantjatjara Yankunytjatjara Land Rights Act 1981, had a similar effect in South Australia. Malaysia recognized various statutory rights related to native customary laws ("adat") before its courts acknowledged the independent existence of common law aboriginal title. Native Customary Rights (NCR) and Native Customary Land (NCL) are provided for under section 4(2) of the National Land Code 1965, the Sarawak Land Code 1957, the respective provisions of the National Land Code (Penang and Malacca Titles) Act 1963, and the Customary Tenure Enactment (FMS). Rajah's Order IX of 1875 recognized aboriginal title by providing for its extinguishment where cleared land was abandoned. Rajah's Order VIII of 1920 ("Land Order 1920") divided "State Lands" into four categories, one of them being "native holdings," and provided for the registration of customary holdings. The Aboriginal People's Act 1954 creates aboriginal areas and reserves, also providing for state acquisition of land without compensation. Article 160 of the Federal Constitution declares that custom has the force of law. The case ultimately did not lead to the inclusion of the Aboriginal title in South African doctrine. Legal scholars allege that this is because the application of terms like 'indigenous' and 'Aboriginal' in a South African context would lead to a number of contradictions. ^ For modern litigation over the same land, see Mohegan Tribe v. Connecticut, 483 F. Supp. 597 (D. Conn. 1980), aff'd, 638 F.2d 612 (2d Cir. 1980), cert. denied 452 U.S. 968, on remand, 528 F. Supp. 1359 (D. Conn. 1982). ^ Several earlier cases tangentially involved issues of native title: Attorney-General v Brown (1847) 1 Legge 312; 2 SCR (NSW) App 30; Cooper v Stuart  UKPC 16, (1889) 14 AC 286, Privy Council (on appeal from NSW); Williams v Attorney General (NSW)  HCA 33, (1913) 16 CLR 404, High Court (Australia); Randwick Corporation v Rutledge  HCA 63, (1959) 102 CLR 54, High Court (Australia); Wade v New South Wales Rutile Mining Co Pty Ltd  HCA 28, (1969) 121 CLR 177, High Court (Australia). ^ Currently, section 261 of the Coal Mines Act 1979. ^ a b c d McNeil, 1989, at 161–179. ^ The Case of Tanistry (1608) Davis 28 (conquest of Ireland). ^ Witrong v. Blany (1674) 3 Keb. 401 (conquest of Wales). ^ Campbell v. Hall (1774) Lofft 655. ^ Oyekan & Ors v Adele  2 All ER 785 (Nigeria). ^ Mark Walters, "'Mohegan Indians v. Connecticut'(1705–1773) and the Legal Status of Aboriginal Customary Laws and Government in British North America" Archived 6 July 2011 at the Wayback Machine, 33 Osgoode Hall L.J. 4 (2007). ^ In re Southern Rhodesia  AC 211. ^ a b Amodu Tijani v. Southern Nigeria (Secretary),  2 AC 399. ^ In re Southern Rhodesia  AC 211, 233–34. ^ In chronological order: Sobhuza II v Miller  AC 518 (Swaziland); Sunmonu v Disu Raphael (Deceased)  AC 881 (Nigeria); Bakare Ajakaiye v Lieutenant Governor of the Southern Provinces  AC 679 (Nigeria); Sakariyawo Oshodi v Moriamo Dakolo (4)  AC 667 (Nigeria); Stool of Abinabina v. Chief Kojo Enyimadu (1953) AC 207 (West African Gold Coast); Nalukuya (Rata Taito) v Director of Lands  AC 325 (Fiji); Adeyinka Oyekan v Musendiku Adele 2 All ER 785 (West Africa). ^ Nyali v Attorney General  1 QB 1 (Lord Denning). ^ Milirrpum v Nabalco Pty Ltd (1971) 17 FLR 141 (27 April 1971) Supreme Court (NT, Australia). ^ Aboriginal Land Rights (Northern Territory) Act 1976 (Cth). ^ Anangu Pitjantjatjara Yankunytjatjara Land Rights Act 1981 (SA). ^ Mabo v Queensland (No 1)  HCA 69, (1988) 166 CLR 186 (8 December 1988), High Court (Australia). ^ Mabo v Queensland (No 2)  HCA 23, (1992) 175 CLR 1 (3 June 1992), High Court (Australia). ^ Native Title Act (Cth). ^ Western Australia v Commonwealth  HCA 47, (1988) 166 CLR 186 (16 March 1995), High Court (Australia). ^ Wik Peoples v The State of Queensland  HCA 40, (1996) 187 CLR 1 (23 December 1996), High Court (Australia). ^ Members of the Yorta Yorta Aboriginal Community v Victoria  HCA 58, (2002) 214 CLR 422 "Judgment Summary" (PDF). High Court (Australia). 12 December 2002. 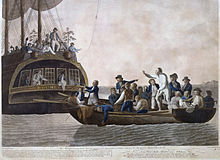 ^ Attorney-General for British Honduras v Bristowe  UKPC 46, (1880) 6 AC 143, Privy Council (on appeal from British Honduras). ^ McNeil, 1989, at 141–147. ^ a b Supreme Court Claims Nos. 171 and 172 of 2007 (Consolidated) re Maya land rights Archived 17 July 2010 at the Wayback Machine. ^ Inter-American Commission on Human Rights. 12 October 2004. Report Nº 40/04, Case 12.053, Merits, Maya Indigenous Communities of the Toledo District, Belize Archived 9 June 2011 at the Wayback Machine. ^ Supreme Court Claim No. 366 of 2008 – The Maya Leaders Alliance and the Toledo Alcaldes et al v The Attorney General of Belize et al and Francis Johnston et al Archived 16 July 2010 at the Wayback Machine. ^ Sesana and Others v Attorney General (52/2002)  BWHC 1. ^ St. Catharines Milling v. The Queen (1888) 14 App. Cas. 46. ^ a b Calder v. British Columbia (Attorney General) (1973) 34 DRL (3d) 145. ^ R. v. Guerin  2 S.C.R. 335 (Wilson J.). ^ R. v. Syliboy  1 D.L.R. 307 (Nova Scotia County Court). ^ R. v. Simon  2 S.C.R. 387. ^ R. v. Sparrow  1 S.C.R. 1075. ^ R. v. Adams (1996) 138 DLR (4th) 657. ^ R. v. Van der Peet (1996) 137 DLR (4th) 289. ^ R. v. Côté  3 S.C.R. 139. ^ R. v. Sappier  2 S.C.R. 686. ^ R. v. Morris  2 S.C.R. 915. ^ Delgamuukw v. British Columbia  153 D.L.R. (4th). ^ Mitchell v. Canada  1 S.C.R. 911. ^ Tsilhqot'in Nation v. British Columbia, 2007 BCSC 1700. ^ R. v. Marshall, 2005 SCC 43. ^ Bartlett, R.. "The Content and Proof of Native Title: Delgamuukw v Queen in right of British Columbia", Indigenous Law Bulletin 19 (1998). ^ Bartlett, R., "The Different Approach to Native Title in Canada," Australian Law Librarian 9(1): 32–41 (2001). ^ Osoyoos Indian Band v. Oliver (Town), 2001 SCC 85. ^ Haida Nation v. British Columbia (Minister of Forests), 2004 SCC 73. ^ Mikisew Cree First Nation v. Canada (Minister of Canada Heritage), 2005 SCC 69. ^ "Landmark Supreme Court ruling grants land title to B.C. First Nation". Vancouver Sun. Retrieved 28 September 2014. ^ "Supreme Court expands land-title rights in unanimous ruling". The Globe and Mail. Retrieved 28 September 2014. ^ "Defining Native Customary Rights to Land". Retrieved 28 September 2014. ^ Sumbang Anak Sekam v Engkarong Anak Ajah  SCR 95. ^ Sat Anak Akum & Anor v RAndong Anak Charanak Charereng  SCR 104. ^ Galau & Ors v Penghuluimang & Ors  1 MLJ 192. ^ Bisi ak Jinggot @ Hilarion Bisi ak Jenggut v Superintendent of Lands and Surveys Kuching Division & Ors  4 MLJ 415. ^ Sapiah binti Mahmud (F) v Superintendent of Lands and Surveys, Samarahan Division & 2 Ors  MLJU 0410. ^ Selangor Pilot Association v Government of Malaysia  2 MLJ 66. ^ Keruntum Sdn Bhd v. Minister of Resource Planning . ^ Koperasi Kijang Mas v. Kerajaan Negeri Perak  CLJ 486. ^ Adong bin Kuwau v. Kerajaan Negeri Johor  1 MLJ 418. ^ Kerajaan Negri Johor & Anor v Adong bin Kuwau & Ors  2 MLJ 158. ^ Nor anak Nyawai & Ors v Borneo Pulp Plantation Sdn Bhd & Ors  6 MLJ 241. ^ Sagong bin Tasi & Ors v Kerajaan Negeri Selangor & Ors  2 MLJ 591. ^ Kerajaan Negeri Selangor & Ors v Sagong Bin Tasi & Ors  6 MLJ 289. ^ Amit bin Salleh & Ors v The Superindent, Land & Survey Department, Bintulu & Ors  7 MLJ 10. ^ Madeli bin Salleh (Suing as Administrator of the Estate of the Deceased, Salleh bin Kilong) v Superintendent of Lands & Surveys (Miri Division) and Ors  MLJU 240;  5 MLJ 305. ^ Superintendent of Lands & Surveys, Bintulu v Nor Anak Nyawai & Ors  4 AMR 621;  1 MLJ 256. ^ Hamit bin Matusin & Ors v Penguasa Tanah dan Survei & Anor  3 MLJ 289. ^ Shaharuddin bin Ali & Anor v Superintendent of Lands and Surveys, Kuching Division & Anor  2 MLJ 555. ^ a b Superintendent of Lands & Surveys Miri Division & Anor v Madeli bin Salleh (suing as the administrator of the estate of the deceased, Salleh bin Kilong)  6 CLJ 509;  2 MLJ 677. ^ Mohamad Rambli bin Kawi v Superintendent of Lands Kuching & Anor  8 MLJ 441. ^ a b R v Symonds "(1847) NZPCC 387". Archived from the original on 1 May 2014. Retrieved 28 September 2014. ^ Oakura (1866) (unreported) (CJ Fenton). ^ Re Lundon and Whitaker Claims Act 1871 (1872) NZPCC 387. ^ Wi Parata v the Bishop of Wellington (1877) 3 N.Z. Jur. (N.S.) 72. ^ Nireaha Tamaki v Baker  UKPC 18,  AC 561, Privy Council (on appeal from New Zealand). ^ Te Teira Te Paea v Te Roera Tareha  UKPC 50,  AC 56, Privy Council (on appeal from New Zealand). ^ Wallis v Solicitor-General for New Zealand  UKPC 50,  AC 173, Privy Council (on appeal from New Zealand). ^ Hohepa Wi Neera v Wallis (Bishop of Wellington)  NZGazLawRp 175; (1902) 21 NZLR 655, Court of Appeal (New Zealand)..
^ Hoani Te Heuheu Tukino v Aotea District Maori Land Board  UKPC 6,  AC 308, Privy Council (on appeal from New Zealand). ^ "Counties Act 1886". NZLII. ^ "The Opuatia Survey Dispute,". New Zealand Herald. 10 March 1894. p. 5. Retrieved 27 April 2018. 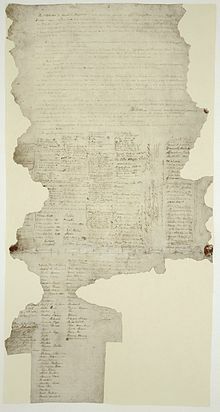 ^ "Some Government Breaches of Te Tiriti o Waitangi" (PDF). Treaty Resource Centre. ^ Tamihana Korokai v Solicitor-General (1912) 32 NZLR 321. ^ Re Lake Omapere (1929) 11 Bay of Islands MB 253. ^ In Re Bed of Wanganui River . ^ In Re Ninety-Mile Beach  NZLR 461. ^ Keepa v. Inspector of Fisheries; consolidated with Wiki v. Inspector of Fisheries  NZLR 322. ^ Te Weehi v Regional Fisheries Office (1986) 1 NZLR 682. ^ Huakina Development Trust v Waikato Valley Authority  2 NZLR 188. ^ New Zealand Maori Council v Attorney-General  NZCA 60,  1 NZLR 641, Court of Appeal (New Zealand). ^ New Zealand Maori Council v Attorney-General  NZCA 269, Court of Appeal (New Zealand). ^ Tainui Maori Trust Board v Attorney-General  2 NZLR 513 (coal). ^ Te Runanganui o Te Ika Whenua Inc Society v Attorney-General  2 NZLR 641 (fishing rights). ^ Ngai Tahu Maori Trust Board v Director-General of Conservation  3 NZLR 553 (whale watching). ^ McGuire v Hastings District Council  UKPC 43;  2 NZLR 577. ^ Attorney-General v Ngati Apa  2 NZLR 661. ^ Attorney-General v Ngati Apa  3 NZLR 643. ^ Geita Sebea v Territory of Papua  HCA 37, (1941) 67 CLR 544, High Court (Australia). ^ Administration of Papua and New Guinea v Daera Guba  HCA 59, (1973) 130 CLR 353, High Court (Australia). ^ Custodian of Expropriated Property v Tedep  HCA 75, (1964) 113 CLR 318, High Court (Australia). ^ Teori Tau v The Commonwealth  HCA 62, (19659) 119 CLR 564, High Court (Australia). ^ Tolain, Tapalau, Tomaret, Towarunga, and Other Villagers of Latlat Village v Administration of the Territory of Papua and New Guinea; In re Vulcan Land [1965–66] PNGLR 232. ^ Administration of the Territory of Papua and New Guinea v Blasius Tirupia and Others (In Re Vunapaladig and Japalik Land) [1971–72] P&NGLR 229. ^ Rahonamo v Enai and Another (Re Hitau) (1971) unreported judgment N612 . ^ Toare Karakara v The Independent State of Papua New Guines  PNGLR 186. ^ Madaha Resena and Others v The Independent State of Papua New Guinea  PNGLR 22. ^ Alexkor Ltd v Richtersveld Community  ZACC 18; 2004 (5) SA 460; 2003 (12) BCLR 1301. ^ a b c Cavanagh, Edward (June 2013). "The History of Dispossession at Orania and the Politics of Land Restitution in South Africa". Journal of Southern African Studies. 39 (2): 391–407. doi:10.1080/03057070.2013.795811. ^ Richtersveld Community v Alexkor Ltd and Anor, 2001 (3) 1293 (22 March 2001). ^ Richtersveld Community & Ors v Alexkor Limited & Anor (unreported, 24 March 2003). ^ Dorsett, S., "Making Amends for Past Injustice: Restitution of Land Rights in South Africa," 4(23) Indigenous Law Bulletin 4(23), pp. 9–11 (1999). ^ Mostert, H. and Fitzpatrick, P., Law Against Law: Indigenous Rights and the Richtersveld Decision (2004). ^ Patterson, S., "The Foundations of Aboriginal Title in South Africa? The Richtersveld Community v Alexkor Ltd Decisions," Indigenous Law Bulletin 18 (2004). ^ a b c Lehmann, Karin (7 April 2017). "Aboriginal Title, Indigenous Rights and the Right to Culture". South African Journal on Human Rights. 20 (1): 86–118. doi:10.1080/19962126.2004.11864810. ^ R. v. Bukunda Kilanga and Others, High Court Sessional Case No. 168 of 1976 (Unreported). ^ Noya Gomusha and Others v. R. TLR 19. ^ Mulbadaw Village Council and 67 Others v. National Agricultural and Food Corporation, High Court of Tanzania at Arusha, Civil Case No. 10 of 1981 (Unreported). ^ National Agricultural and Food Corporation v. Mulbadaw Village Council and Others  TLR 88. ^ Government Notice No. 88 of 13 February 1987. ^ Tito Saturo and 7 Others v. Matiya Seneya and Others, High Court of Tanzania at Arusha, Civil Appeal No. 27 of 1985 (Unreported) (Chua, J.). ^ Attorney-General v. Lohay Akonaay and Another  TZCA 1;  2 LRC 399 (Court of Appeal of Tanzania, Civil Appeal No. 31 of 1994) (Nyalali, C.J.). ^ Lekengere Faru Parutu Kamunyu and 52 Others v. Minister for Tourism, Natural Resources and Environment and 3 Others, Civil Appeal No 53 of 1998, unreported, (1999) 2 CHRLD 416 (Court of Appeal of Tanzania at Arusha) (Nyalali, C.J.). ^ Johnson v. M'Intosh, 21 U.S. 543, 573 (1823). ^ Marshall v. Clark, 1 Ky. 77 (1791). ^ Goodell v. Jackson, 20 Johns. 693 (N.Y. 1823). ^ United States v. Santa Fe Pac. R. Co., 314 U.S. 339 (1942). ^ Seminole Nation v. United States, 316 U.S. 286 (1942). ^ United States v Sioux Nation, 448 U.S. 371 (1980). ^ 25 U.S.C. § 70, et seq 28 U.S.C. § 1505. ^ United States v. Alcea Band of Tillamooks, 329 U.S. 40 (1946). ^ Fort Berthold Reservation v. United States, 390 F.2d 686, 690 (Ct. Cl. 1968). ^ Alabama-Coushatta Tribe of Texas v. United States, 28 Fed Cl 95 (1993); order modified by 2000 WL 1013532 (unreported). ^ McNeil, 1989, pp. 136–141, 147–157. ^ Freeman v. Fairie (1828) 1 Moo. IA 305. ^ Vaje Singji Jorava Ssingji v Secretary of State for India (1924) L.R. 51 I.A. 357. ^ Virendra Singh & Ors v. The State of Uttar Pradesh  INSC 55. ^ Vinod Kumar Shantilal Gosalia v. Gangadhar Narsingdas Agarwal & Ors  INSC 150. ^ Sardar Govindrao & Ors v. State of Madhya Pradesh & Ors  INSC 52. ^ R.C. Poudyal & Anr. v. Union of India & Ors  INSC 77. Gray, S. "Skeletal Principles in Malaysia's Common Law Cupboard: the Future of Indigenous Native Title in Malaysian Common Law" Lawasia Journal 99 (2002). Tenga, Ringo Willy. 1992. Pastoral Land Rights in Tanzania.